We're super happy to be hosting the launch for this year's Mayfest festival...as well as three fantastic shows. To celebrate their return (having taken the decision to become a biannual festival), Mayfest have invited "Ghanaian DJ and producer Katapila to kick off the festival with one of his marathon, euphoria-drenched DJ sets. Splicing the neo-traditional dance music styles of his youth in Accra with the up-tempo, bass-heavy, Roland 808 sounds of Detroit techno, Chicago acid and house, Katapila’s relentlessly joyful sets have become a thing of legend" in Trinity's Main Hall. Come on down (10 May) and expect killer selections adorned with splashes of digital synths, electronic percussion and vocal interjections that galvanise waves of full-blown euphoria wherever he plays. So, for those who haven't been - what is Mayfest? Mayfest is Bristol’s unique international festival of contemporary theatre, "dedicated to presenting a broad range of unusual, playful and ambitious work from leading theatre makers from Bristol, the UK and beyond". 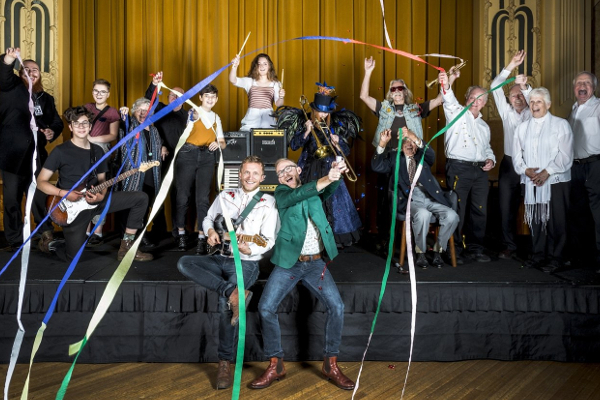 They will be taking over theatre (and non theatre) spaces across the city bringing 10 days of back to back performances, workshops and talks from Thur 10th - to Sun 20th May. This year we are excited to be hosting How (not) to live in Surburbia (14-15 May) a new show from Annie Siddons "a hilarious, brutal and poignant attempt" to describe what happened next when "in the middle of a shitstorm of life events, single mother, artist and proud Londoner Annie Siddons found herself living in suburbia by accident". Meanwhile, Scottish Dance Theatre bring Velvet Petal (16-18 May) to Fyfe Hall where they present their latest show about"tough girls and pretty boys living life in the margins, dreaming about being at the centre". They explore "the transformative power of beauty, created out of whatever is on the bedroom floor" in this "truly compelling piece, exquisitely performed” (The Stage). Finally it feels very fitting to be hosting acclaimed Australian artist Joseph O’Farrell (JOF) and Sam Halmarack who combine theatre with the fist-pumping euphoria and power ballads of a stadium gig, in WE ARE LIGHTNING! (15-18 May) "a darkly comical work that reflects on the importance of communal spaces where people can come together and express themselves". For more info on the rest of their programming visit Mayfest's website here.